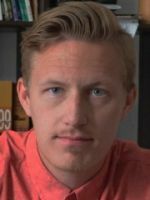 Emil Lundedal Hammar is a PhD candidate in Game and Memory Studies at the Department of Culture & Language at UiT Tromsø, Norway under the supervision of Dr. Holger Pötszch. He holds a Cand. IT. in games analysis from the IT University of Copenhagen and a Ba. in philosophy from the University of Copenhagen. In 2016 he won first prize with the personal essay on the relation between being a citizen of a former slave nation of Denmark and playing contemporary digital games dealing with the 18th century Caribean slave system in the essay contest ‘Digital Lives’ organized by the Norwegian cultural organization Fritt Ord. He currently coordinates the international ENCODE research network at UiT Tromsø and is part of the WARGAME research group. Together with Dr. Souvik Mukherjee, Emil also co-edits a special issue on postcolonial perspectives in Game Studies for the Open Library of Humanities. His research interests include game studies, memory studies, critical race theory, the political economy of communication, critical & materialist approaches to media, and postcolonialism. Emil’s research project focuses on the intersection between digital games, cultural memory, and hegemony with particular attention to race & the political economy of historical games. The first article of his dissertation titled ‘Counter-hegemonic commemorative play: marginalized pasts and the politics of memory in the digital game Assassin’s Creed: Freedom Cry‘ was published in the journal Rethinking History. This article dealt with how players activate and negotiate memory potentials of a historical digital game via its signs and mechanical system in relation to marginalized positions within contempoary power hierarchies. The second article titled ‘The Political Economy of Historical Digital Games‘ published in Media Development gave a broad and accessible overview of how digital games production networks and their embedded consumption cultures construct and reinforce contemporary power hierarchies. The final stages of the research project looks to critically investigate the concept of prosthetic memory in the context of historical digital games; then publish insights into memory production from interviews conducted with historical game producers; and finally explore the ways that practices of play as an appropriative activity influence or contribute to cultural memory.